With over twenty years of doing business in Pagosa Springs, Precision Autobody & Collision has expanded to a larger facility to better serve our community. Precision is recommended by insurance as a full service collision repair shop offering auto body repair and refinishing, paintless dent repair, glass replacement and frame straightening. Locally owned and operated, Precision can handle everything from minor repairs to major collisions. We also have a mechanic on site! Our company was founded on the principals of honesty and integrity. We provide the highest quality auto body repair work in Pagosa Springs and the surrounding area — from South Fork to Durango. Our Mission is to perform a “Precision” repair which will restore your vehicle to it’s pre-accident condition. We ensure customer satisfaction and peace of mind, for individuals, fleet and insurance companies. If you are looking for precise, quality workmanship to repair your vehicle, come by for an estimate. We are located at 667 Cloman Blvd., Pagosa Springs CO. (Out by the airport). Meet Suze and Michael Hall. Their attention to detail and exemplary customer service is second to none. Mike graduated from Wichita Automotive Institute in Wichita Kansas, a NATTS Accredited school, in Nov. 1977. He holds a diploma for Auto Body Repair & Refinishing. Mike has 40 years of experience in this industry. Suze has worked in Public Relations for over 30 years and has been serving Pagosa Springs since 1980. Together, they have lived in and happily served the Pagosa Springs community for many years. 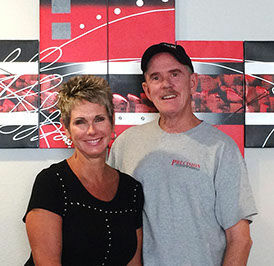 Together, they have moved to a new, much larger facility for their business: Precision Autobody & Collision. They repair and repaint collision-damaged vehicles and do custom work on classic/antique cars. Stop by and visit them at their newly renovated facility out by the airport on Cloman Blvd.